Don’t listen to Jacinda’s rhetoric about how only the top 20% of taxpayers will pay CGT. That 20% will include a lot of people who are far from wealthy. It will include people with small businesses, with lifestyle blocks and with KiwiSaver. As everyone who has a KiwiSaver account will be affected on an annual basis, her claim that only the top 20% will be affected is incorrect anyway. quote. In his first big economic speech of the year, at least Finance Minister Grant Robertson acknowledged there is an issue for this country at the moment. Like all good relationships, he said, there will be issues arising from time to time that have to be dealt with and we can’t shy away from those. Exporters were encountering issues around softening demand and there were regulatory issues with China, which is shorthand for trouble at the border. And the elephant trumpet in the room full of suits of course couldn’t be ignored. Robertson unwittingly confirmed the reaction to the Taxation Working Group’s report is causing some consternation on the upper floors of the Beehive. end quote. Honestly, I just don’t get these guys. They have had plenty of warning that CGT is political suicide, but they are so governed by their socialist ideology, they seem to think that we will all come to our senses and realise that they know best. It won’t happen.quote. When one politician repeats verbatim what another one has said, the orchestration of the response is obvious. Think of the National Party parrots at the height of the bullying allegations. Both Simon Bridges and his sidekick Paula Bennett were word-perfect, emphasising the “strong culture” in the party and that “people liked coming to work”. They’d been schooled – just like Labour’s been over the working group’s recommendations. Robertson’s buddy boss Jacinda Ardern told us after Cabinet that “by and large the New Zealand tax system works well”, a line repeated word for word by the Finance Minister to the business boffins. end quote. It does work well. Compared to many tax systems around the world, it is relatively simple… something that will change dramatically with the introduction of CGT. quote. And they were both at pains to point out the Government wasn’t bound to take up all of the working group’s recommendations, which in real speak means the end result won’t resemble the beginning. In fact it’ll be vastly different once the coalition cobbers, in particular Labour and New Zealand First, have a roll on the grass. end quote. The end result will probably be very different now, but only because the reaction to CGT has been so negative. Remember how the TWG said they couldn’t make CGT work, and Grant Robertson told them to go back and try harder? quote. The view of James Shaw of the Greens – that the Government doesn’t deserve to be re-elected if it doesn’t adopt a capital gains tax – won’t be that difficult to resolve. As Winston Peters has repeatedly said, we already have a capital gains tax, it’s called the brightline test. That is where I think this whole debacle will end up. All businesses will be exempt, and possibly shares because we have long been told to invest in productive assets. The ridiculous attempts to tax the family home by any means possible will be thrown out, meaning lifestyle blocks and homes that have had rooms rented or used as an office will be exempted. Retirement savings, including KiwiSaver, will be exempted on the grounds that people must be encouraged to save for retirement. Farms will be left alone. That only leaves investment property, which has been the focus of this whole exercise from Day 1 anyway. We will end up with a perpetual Bright Line Test. This will finish off the private rental market, and will leave hundreds of thousands of people with nowhere to live. Yes, those rental houses that are sold will go to first time buyers, but there will always be a pool of people who need to rent. Some people will never own their own house, and some will need temporary rental accommodation. Either way, it is more bad news for tenants, as landlords sell up in droves and take their nice, juicy capital gains with them before the tax is introduced. This is what socialist ideology does to our society. Figures released to Newshub show that the KiwiBuild targets have turned out, like every other target from the current inept bunch of bunglers in the Beehive, to be ‘aspirational’. The KiwiBuild programme was launched in July 2018 and we were assured by Twyford that it would deliver 100,000 homes for first home buyers over the next decade. That seems rather like 10,000 per year for 10 years, in simple average terms. quote. Since the annual targets were dropped, the Government has been using “over 10,000” as the number of KiwiBuild homes that it’s got contracted or committed. Prime Minister Jacinda Ardern celebrated the figure in her official start of the year statement. But figures released to Newshub show that just 341 of those 10,000 will be built this year, and nearly a fifth won’t be built until the final two years of the programme. A total of 10,355 houses in 10 years. Has anyone seen the lost 89,645 houses? Lurking in Te Kauwhata perhaps? quote. […] on November 8, a new manager began at the Ministry. Around that time, [former head of the Ministry of Housing and Urban Development’s KiwiBuild unit Stephen Barclay] left the office, never to return. And by November 26, the number of homes that were highly likely to be built plummeted. The Ministry would not do an interview with Newshub, but sent a statement saying it became aware of potential issues with the numbers, and looked into it further. After an audit of KiwiBuild, the Ministry found the numbers were way off. That meant houses that were in very early stages of negotiations were being sold to the Housing Minister as a done deal. In a statement, Mr Barclay told Newshub his numbers were accurate, and that it appeared something changed after he left. Phil Twyford is in Australia so was unavailable for an interview, but sent Newshub a statement. “This matter is related to an ongoing employment dispute so it would be inappropriate for me to comment,” he said. “There is new leadership in place in the KiwiBuild Unit which is working hard to get much-needed affordable homes built.” end quote. Yadda, yadda, yadda Phil. Its dead, Phil – give it a decent burial. I disagree most emphatically with extra taxation on retirement savings in any shape or form. Remember that KiwiSaver contributions are made from tax paid money. I bitterly disagreed when the National government taxed the employer contributions towards KiwiSaver, on the grounds that we are trying to encourage people to save for their own retirement, and as such, it is just a tax grab. However, it seems that Michael Cullen, the architect of the original Kiwisaver scheme, thinks it is perfectly fine to tax the capital gains made on Kiwisaver funds… even though, without them, even if you have a Kiwisaver fund, you will probably have a miserable retirement. quote. Proposed changes to KiwiSaver by the Tax Working Group would redistribute wealth by boosting savings for low and middle income earners while reducing that of higher earners. But it would do so in an overly-complicated way which could have unintended consequences, experts say. Sir Michael Cullen’s Tax Working Group revealed a proposal to apply a capital gains tax to shares which would mean investments in New Zealand and Australian shares by KiwiSaver would be taxed on an accrual basis. But to balance that out it has recommended that savers be compensated by one or more of four options; a refund of the tax on the employer’s KiwiSaver contribution for those earning under $48k and a claw-back for those earning up to $70k, an increase in the member tax credit and a reduction of the investment tax paid by those on the lowest rates. end quote. And if you earn over $70,000… fabulously wealthy though you are… you will be considerably worse off. quote. Taking both into account KiwiSaver provider Simplicity has worked out those earning $40k and investing in a growth fund would stand to gain about $109k extra in their pot at retirement over a life-time of saving while those earning $70k would be down under $1k and those on $100k would be down $13,536. Sir Michael really does love to tax ‘rich pricks’, doesn’t he? If you earn $100,000 a year, you already pay 33% tax on 30% of your income, so the government has absolutely no right to take away chunks of your retirement savings as well, especially as this does not happen to savers on low incomes. quote. The same calculations for investment in a balanced fund would mean all three income groups benefitted from the changes. Sam Stubbs, Simplicity managing director, said the proposals were clearly aimed at redistributing wealth – giving more to the poor and taking away from the rich. If you didn’t realise how much of an envy tax CGT is, look no further than this. This policy may also drive people away from KiwiSaver and into other retirement funds, as the disadvantages of Kiwisaver for higher earners are now becoming disparate… probably exactly as Michael Cullen always intended. quote. Martin Hawes, a financial adviser who chairs the Summer KiwiSaver investment committee, said a low income couple who saved in KiwiSaver and were expecting a baby potentially had the most to gain from the proposals. But he doubted the changes would be enough to encourage a low income earner to join KiwiSaver – something the Labour party has been keen on doing. Since its inception, a lot of people have joined Kiwisaver, and many now have retirement savings that they would never have had otherwise. This is true of both low wage earners and those who are better paid. These retirement savings should not, however, form a source of tax grab for a greedy government. If the government wants us all to save for retirement, then they have to provide an incentive. Taxing retirement savings even further is not going to encourage people to save for retirement. It will encourage people to spend the lot and depend on the government in their twilight years. Newshub has obtained documents that paint a picture of exactly how the KiwiBuild targets unravelled. In October, everything seemed peachy. Housing Minister Phil Twyford was told there was a high certainty of 627 homes being complete by July this year, and a further 430 were in the works. That would have pushed KiwiBuild across the line to meet the first-year target of 1000 homes. But by the end of November, everything came crashing down. Suddenly, just 347 homes were highly likely to be built by July. Communications released to Newshub under the Official Information Act show concerns about the number of houses being contracted were first raised way back in August. The official figures showed that by October, things seemed good. But on November 8, a new manager began at the Ministry. Around that time, Mr Barclay left the office, never to return. And by November 26, the number of homes that were highly likely to be built plummeted. Newshub can also reveal that Mr Twyford only found out about Mr Barclay’s resignation in January when Mr Barclay himself sent out a press release announcing it – an hour after he sent his formal resignation letter. ACT Party leader David Seymour says the Minister should’ve been across it. Since the annual targets were dropped, the Government has been using “over 10,000″ as the number of KiwiBuild homes that it’s got contracted or committed. It seems KiwiBuild is still not hitting any targets. As we drill more and more into the details of the TWG report, it is becoming clear how far reaching their proposed capital gains tax (CGT) has become. Essentially, you will not ever be affected by CGT so long as you never own any assets, have no retirement savings, including Kiwisaver, and never inherit anything. You can have a fantastic art collection, but you will have to have it displayed under a bridge. Otherwise, even if you don’t think you will be affected, you will be… at some point. First, there is the question of lifestyle blocks. Even if you have lived your whole life on a lifestyle block, it does not qualify as a family home. Not the TWG’s definition of it anyway. quote. Lifestyle block owners may be in for a shock if the Capital Gains Tax goes ahead in 2021. Under the recommendations of the Tax Working Group, land that is larger than 4,500 square metres will be subject to the tax. There’s no mention lifestyle blocks will be exempt like family homes, or treated like farms, which allow for the house and surrounds to be left tax-free. Real Estate Institute chief executive Bindi Norwell said the median size of lifestyle properties sold in New Zealand in the last 12 months is 20,000sqm. On the basis of that data, she believes 92 per cent of lifestyle blocks sold across the country last year would be taxable. 92% of lifestyle blocks, most of which are primary residences, will be liable for CGT when sold. So, a million dollar apartment in Auckland’s CBD is exempt, but a piece of land with a house on it in Shannon worth $350,000 is caught by the tax. Do you have a home office? You go home after work and do your paperwork until 10.00 at night? IRD allows you to claim some of your house expenses if you use your home for work. However, if you do have a home office, then your house does not qualify as a ‘family home’ and will be liable for CGT on sale. So business owners are hit twice, with both the business itself and the family home being liable for CGT, for no other reason than because they work hard. What about if you take in flatmates? Young people, particularly single people, trying to get on the home ownership ladder by bringing in flatmates to help pay the mortgage will also find that they will have to pay CGT on the sale of the property, because it was not just a ‘family home’. I assume this applies to people who house foreign students as well. In fact, it gets even worse. If you have a boarder – even a family member, such as an adult child, who pays rent in any form, you are caught by the CGT rules. Does that seem fair to you? Have you ever rented out rooms in your house on Air BnB? Lots of people rent out their spare rooms to foreign travellers to earn a bit of spare cash. Even if you don’t do this often, too bad. When you sell your home, it will be liable for CGT. Does any of this seem fair to you? So, the claim that the family home is exempt from CGT is wildly inaccurate. Your family home will be exempt from CGT so long as you never rent it out in any way, shape or form, or do any type of work in it. All this means that a very significant number of family homes will actually be caught in the CGT net – far more than anyone seems to realise at the moment. When you understand that Michael Cullen thinks that anyone who earns over $70,000 per year is a ‘rich prick’ (he proves this because there are proposed provisions for relief on Kiwisaver accounts for the effects of CGT, but only if you earn less than $48,000), you will understand why all of this falls under their definition of ‘fairness’. There is nothing fair about any of this. This is a tax grab of monumental proportions. This tax must not go ahead in any shape or form. The door yawns wide for a comprehensive envy tax grab, time for another look at Val’s poem, how close was she in 2017? I won’t get very far! Who grow food to feed us all? Does that mean mine as well? Your tax can go to hell! Is nothing off the table? I can’t give to my grand-kids? They can kiss my gift good-bye? My ‘comrade’ you are not! They really do know best. And his team – they’ll get it right! Working Group has recommended one of the most aggressive capital gains taxes in the world. In the last few minutes I was released from the Tax Working Group’s lock-up at Treasury where I received the Group’s final report and a media briefing from Working Group Chair (and former Labour Party Minister of Finance) Sir Michael Cullen. As we feared, the majority on the Working Group has recommended one of the most aggressive capital gains taxes in the world. Sir Michael’s group was supposed to deliver ‘fairness’. Instead, he’s given something Kiwi taxpayers should fear. In our recent report, we outlined Five Rules for a Fair Capital Gains Tax, but any notion of fairness has been flagrantly disregarded by the Working Group. It fails most of our tests. As expected, the Group is proposing a full-scale capital gains tax, among other measures such as environmental taxes. Capital gains will be charged at 33% for the majority of taxpayers – one of the most punitive capital gains tax regimes in the world, and more than twice the rate proposed by the Labour Party at the 2011 and 2014 elections. There will be no inflation adjustment – even paper gains will be hoovered up by IRD. Revenue neutrality only applies for the first five years: while the group proposes changes to income tax thresholds (see below) most of the revenue from a capital gains tax is forecast to be collected after five years — after ‘revenue neutrality’ has expired. ‘Valuation Day’ is imminent: taxpayers will be forced to value their assets within five years, or must rely on rough and ready evaluations (such as rateable value for land). Even though the Government explicitly ruled out taxing the family home, properties larger than 4500m2will in fact be taxed. The message to regional New Zealand is that their lifestyle blocks, farms, and semi-rural properties don’t deserve the protection given to Wellington and Auckland penthouses and townhouses. Iwi-owned businesses will pay a discounted rate (17.5 percent, compared to 33 percent for other businesses). In short, the proposal is as bad as we could have feared. It is a costly, bureaucratic, and seemingly envy-driven tax grab. It threatens New Zealand’s prosperity, drives up housing costs, and punishes responsible investors. You can read the Tax Working Group’s final report here. While the Working Group supports adjusting the bottom tax threshold, they propose coupling this with an increase in the second tax rate from 17.5% to 20.5% to increase ‘progressivity’. From an economic incentive perspective, this is a terrible move. Even though many taxpayers will receive a small tax cut, middle-income earners would face a higher marginal tax rate on additional earnings, which reduces the incentive to take on more hours, skill-up, or take-on extra responsibility at work. 45.6 percent of earners fall within the second tax bracket, hundreds of thousands of earners could be affected by this distortion in incentives – the cumulative economic effect would be massive. While my job is to advise on the technical details and economic impact, from what I’ve read this morning it is almost certain the Taxpayers’ Union will be fighting this with everything we’ve got. A campaign to Axe This Tax will almost certainly be put into effect: to force the Government to reject the extreme proposals. In the meantime, feel free to forward this email to friends and colleagues — those interested in following our campaign can sign-up here to receive updates. Similarly, if you have suggestions of how we can work together to Axe This Tax, reply to this email, or contact us using the website. We look back at the role of Andrew Little and the Engineering, Printing and Manufacturing Union in the Pike River mining disaster. I don’t usually repost my own posts and, in fact, this is the first repost I’ve ever done. But I think it is worth giving this story another airing given the rise in political prominence of Andrew Little. I considered rewriting the story but I think the original post speaks for itself. It outlines the role of the Engineering, Printing and Manufacturing Union (EPMU) in the Pike River mining disaster, which saw 29 men lose their lives. Labour Party leader Andrew Little was national secretary of the EPMU at the time. This story was first published on 8 November, 2012. Last month Andrew Little went to Pike River to attend the memorial to mark the fourth anniversary of the tragedy. He told the media that he attended the commemorations to stand alongside the families. WHEN THE Royal Commission of Inquiry into the Pike River mining disaster issued its report this week, the response of the Engineering, Printing and Manufacturing Union (EPMU) was immediate. It issued a press statement welcoming the report and is encouraging the Government to implement the recommended changes as soon as possible. This report is a damning indictment of New Zealand’s deregulated health and safety regime. Pike River Coal Ltd should never have been allowed to operate in the way it did, and in other countries it wouldn’t have been allowed to. The report makes clear that the tragic loss of life at Pike River could have been prevented with stronger regulations, an independent and well-resourced mine safety inspectorate and genuine worker involvement in health and safety. We hope the failings exposed in this report spell the end of the deregulated health and safety regime of the last 20 years. This vindicates the union’s repeated calls for improvements in mine safety and for the reintroduction of check inspectors. This statement represents a complete change of heart by the EPMU officialdom because it was never critical of Pike River Coal (PRC) during the time that the mine was open. The EPMU represented approximately half of the 140 miners on the site. After the first explosion the EPMU strongly defended the management of PRC. EPMU National secretary Andrew Little (now a Labour MP) told the New Zealand Herald on November 22 2010 that there was “nothing unusual about Pike River or this mine that we’ve been particularly concerned about”. He then appeared on TVNZ’s Close Up to again defend PRC management. He told Close Up that underground mining was inherently unsafe and the risk of gas explosions, particularly on the West Coast, was high. While the industry was aware of the risks and took the necessary precautions, unfortunately these kinds of incidents still happened, he argued. Andrew Little’s conciliatory views toward PRC management were echoed by Labour MP Damien O’Connor. He suggested that no one was responsible for the accident and that the disaster was “just one of these things that the West Coast unfortunately has had to get used to over the years”. Little and O’Connor’s views would of found favour with the Minister for Energy and Resources, Gerry Brownlee. He insisted that PRC had “an absolute focus on health and safety”. So here we had the Government, the Labour Party and the EPMU all lining up to defend the management of PRC. The views of Andrew Little and the EPMU flew in the face of expert opinion. 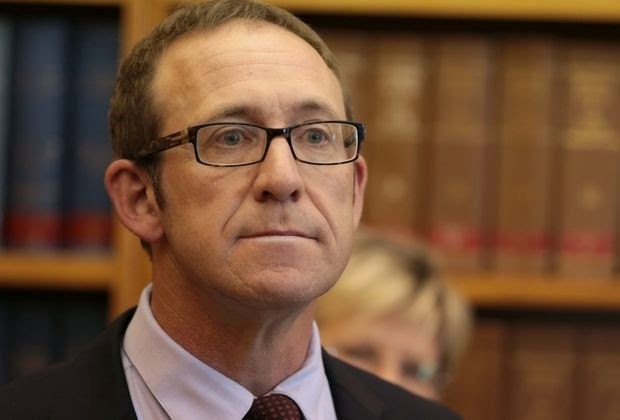 While Andrew Little was defending PRC an Australian gas drainage engineer, who wished to remain anonymous because he feared ‘recriminations’, said he visited Pike River in 2009 and observed that its operating standards were “extremely poor”. He said that he had been told by miners that the mine was flooded with methane gas about three weeks before the first explosion. He said miners had bored through ‘high flow methane holes’ without any risk assessment conducted or procedure on how to manage gas flow from the hole in place. He was critical that PRC has not yet implemented a gas drainage drilling regime that could relieve the pressure when there was a build up of gas by drilling a hole in the coal seam. The New Zealand Herald, also in November 2010, quoted Gerry Morris of Greymouth, a former writer for Coal magazine, who said he had heard regularly from contractors at the mine “over the last two or three years that this mine is unsafe, there’s far too much gas, there’s going to be a disaster here one day”. But despite the overwhelming evidence that there was something seriously and dangerously wrong at the Pike Rive mine, the officials of the EPMU did nothing. The mine opened in November 2008 and on not one occasion did the EPMU initiate industrial action or even criticise PRC’S safety standards, even after a group of workers walked off the job to protest the lack of basic emergency equipment. It was exactly this benevolent attitude by the EPMU that allowed PRC – and the Department of Labour – to continue as if it was just ‘business a usual’. It appears that no-one was protecting the interests and concerns of the workers on the mining site. The EMPU failed to organise industrial action to address safety concerns at the mine in favour of ‘cooperating’ with management, what it and the CTU sometimes refer to as ‘modern unionism’. There won’t be any resignations from within the EPMU for dereliction of duty and, of course, Andrew Little has escaped to Parliament. In August 2017, in the middle of the election campaign, Jacinda Ardern promised a rail connection between Hamilton and Auckland to be fast tracked (pun absolutely intended) so that it would be completed within 18 months. My calculations indicate that the rail connection should therefore be operating in April 2019. So how is it going, Hamilton commuters? I realise the disruption while the rail system was being built or upgraded must have been annoying, but the end result, which must be just about there now, is worth it… right? Labour has promised to fast-track a rail connection between Hamilton and Auckland. Railways will ease congestion, Labour leader Jacinda Ardern said on Monday, but billions of dollars of roads will not. Ardern pledged in front of a teeming crowd in Tauranga her party “will bring rail back within 18 months of taking office”. The $20 million plan will use the existing rail network to run commuter trains between Tauranga, Hamilton and Auckland – also known as “the golden triangle”. [August 2017]. It seems the proposed rail link is nowhere near completion. In fact, it does not appear to have been started yet. quote. A Hamilton to Auckland passenger rail service could soon be a reality, with the New Zealand Transport Agency (NZTA) approving a business case for the next steps towards a five-year trial. Transport Minister Phil Twyford announced on Wednesday [19 December 2018] a business case had been approved, allowing for the fit-out of stock and detailed design of infrastructure. He said it was an “exciting step” towards a five-year trial service expected to begin in March 2020. The trial’s total cost, including the service operated by KiwiRail, is estimated to be $78.2 million, including $68.4 million from the NZTA and $9.8 from local authorities. end quote. So… the connection is already a year behind schedule, the cost is now 4 times what was promised by Jacinda… and it is only going to be a 5 year trial. quote. “Better, faster, more modern rail services” may also one day be on their way, with Mr Twyford saying the rail line could end up with rapid 160km/h tilt trains allowing for 1 hour trips. NZTA will work with councils and KiwiRail to develop a pre-implementation plan early next year. Dear me. It sounds as if Twyford is still in campaign mode, complete with stardust and unicorns. Commuters need more than vague promises about modern rail services being ‘one day on their way’. It is a bit like promising to build 100,000 houses in 10 years, with all of them being built in year 10, which is the ridiculous situation we seem to have at present. Also, with the ‘pre-implementation plan’ being developed in early 2019 (which is now), knowing how long these things generally take, any expectation for the rail connection to be operating at any time in 2020 seems a bit optimistic, don’t you think? Let us not, however, fall into the trap of thinking that this is another broken election promise though, comrades. As the Minister for Transport (and Housing and Urban Development) pointed out recently, promises made by Jacinda before she became prime minister do not count for anything. They were just lies, designed to get her and her bunch of inept fools into government. It is only those promises she has made SINCE becoming prime minister that can be taken as genuine. If Kiwibuild is anything to go by, let us say her record there is not crash hot either. Anyway, I just hope the commuters of Hamilton, as they sit in gridlocked traffic, understand that promises made by someone trying to get elected are meant to be ignored. I do hope no one voted for her on the basis of those false promises. But don’t worry. The rail connection she promised will be here ‘one day’. Don’t ask when ‘one day’ is, though, because no one knows. The first promise Jacinda Ardern made as Labour leader looks to have gone up in smoke. During her first big public outing as leader during the election, she promised rail for all – including a line from the Auckland waterfront to Dominion Rd to Mount Roskill, all to be completed by 2021. The promise was part of a $15 billion package and came with a plea from Ms Ardern – she needed cash to fund it. Cheaper doctor visits: The Government’s first broken promise? “You can call a regional fuel tax ‘crowd-sourcing’ if you like,” she told the public. That part of the promise did come true: Aucklanders are paying the 10 cents a litre more at the pump. But Labour hasn’t done the rail part. On Wednesday, Transport Minister Phil Twyford admitted the Government would fail to build light rail down Dominion Rd by 2021. Instead, he only expects work to start on it next year. However the Government isn’t counting it as a broken promise. Mr Twyford’s defence is that promises made by Jacinda Ardern as Labour leader are completely different from promises made by Jacinda Ardern as Prime Minister. It’s a convenient excuse for a broken promise.